Cities: Capital--Kingston metro area (pop. 628,000). Other cities--Montego Bay (96,600), Spanish Town (122,700). Population: (2005 est.) 2,660,700 million. Annual growth rate (2005): 0.5%. Religious affiliation: Anglican, Baptist and other Protestant, Roman Catholic, Rastafarian, Jewish. Health (2005): Infant mortality rate--19.2/1,000. Life expectancy--female 75 yrs., male 73 yrs. Work force (2005, 1.19 million): Industry--17.8%; agriculture--21.4%; services--60.8%. Branches: Executive--Governor General (chief of state, representing British monarch), prime minister, cabinet. Legislative--bicameral Parliament (21 appointed senators, 60 elected representatives). Judicial--Court of Appeal and courts of original jurisdiction. Political parties: People's National Party (PNP), Jamaica Labour Party (JLP), National Democratic Movement (NDM), United Peoples Party (UPP). Real growth rate (2005): 1.5%. Per capita GDP (2005): $3,430. Natural resources: Bauxite, gypsum, limestone. Agriculture: Products--sugar, bananas, coffee, citrus fruits, allspice. Industry: Types--tourism, bauxite and alumina, garment assembly, processed foods, sugar, rum, cement, metal, chemical products. Trade (2005): Exports--$1.53 billion: alumina, bauxite, sugar, bananas, garments, citrus fruits and products, rum, coffee. Major markets (2000 data)--U.S. 39.1%, U.K. 11.2%, Canada 10.2%, Netherlands 22.0%, Norway 9.1%, CARICOM 3.7%, Japan 2.3%. Imports (2005)--$4.74 billion: machinery, transportation and electrical equipment, food, fuels, fertilizer. Major suppliers (2000)--U.S. 44.8%, Trinidad and Tobago 10.0%, Japan 6.0%, U.K. 3.1%, Canada 3.1%, Mexico 4.8%, Venezuela 3.9%. Historically, Jamaican emigration has been heavy. Since the United Kingdom restricted emigration in 1967, the major flow has been to the United States and Canada. About 20,000 Jamaicans emigrate to the United States each year; another 200,000 visit annually. New York, Miami, Chicago, and Hartford are among the U.S. cities with a significant Jamaican population. Remittances from the expatriate communities in the United States, United Kingdom, and Canada, estimated at up to $800 million per year, make increasingly significant contributions to Jamaica's economy. Parliament is composed of an appointed Senate and an elected House of Representatives. Thirteen Senators are nominated on the advice of the prime minister and eight on the advice of the leader of the opposition. General elections must be held within 5 years of the forming of a new government. The prime minister may ask the governor general to call elections sooner, however. The Senate may submit bills, and it also reviews legislation submitted by the House. It may not delay budget bills for more than 1 month or other bills for more than 7 months. The prime minister and the cabinet are selected from the Parliament. No fewer than two or more than four members of the cabinet must be selected from the Senate. The judiciary also is modeled on the U.K. system. The Court of Appeals is the highest appellate court in Jamaica. Under certain circumstances, cases may be appealed to the Privy Council of the United Kingdom. Jamaica's parishes have elected councils that exercise limited powers of local government. Jamaica's political system is stable. However, the country's serious economic problems have exacerbated social problems and have become the subject of political debate. High unemployment--averaging 15.5%--rampant underemployment, growing debt, and high interest rates are the most serious economic problems. Violent crime is a serious problem, particularly in Kingston. The two major political parties have historical links with two large trade unions--the Jamaica Labour Party (JLP) with the Bustamante Industrial Trade Union (BITU) and the People's National Party (PNP) with the National Workers Union (NWU). The center-right National Democratic Movement (NDM) was established in 1995 and the populist United Peoples Party (UPP) in 2001; neither has links with any particular trade union and both are marginal movements. For health reasons, Michael Manley stepped down as Prime Minister in March 1992 and was replaced by P.J. Patterson. Patterson subsequently led the PNP to victory in general elections in 1993, 1997, and in October of 2002. The 2002 victory marked the first time any Jamaican political party has won four consecutive general elections since the introduction of universal suffrage to Jamaica in 1944. Upon Patterson�s retirement on March 30, 2006, Portia Simpson Miller became the first female prime minister in Jamaica�s history. The current composition of the lower house of Jamaica's Parliament is 34 PNP and 26 JLP. Since the 1993 elections, the Jamaican Government, political parties, and Electoral Advisory Committee have worked to enact electoral reform. In the 2002 general elections, grassroots Jamaican efforts from groups like CAFFE (Citizens Action for Free and Fair Elections), supplemented by international observers and organizations such as The Carter Center, helped reduce the violence that has tended to mar Jamaican elections. Former President Carter also observed the 2002 elections and declared them free and fair. 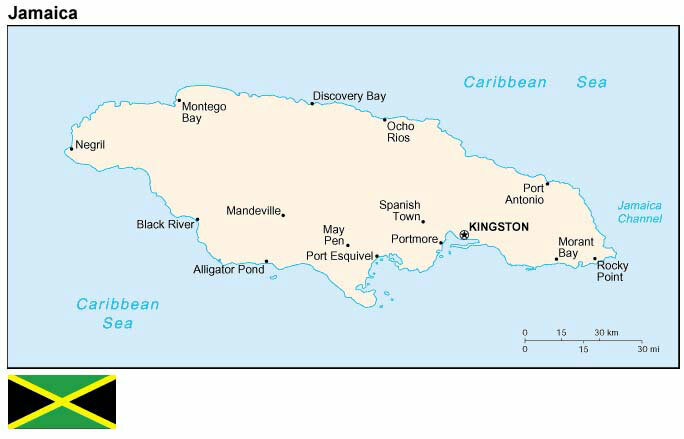 Jamaica has natural resources, primarily bauxite, adequate water supplies, and climate conducive to agriculture and tourism. The discovery of bauxite in the 1940s and the subsequent establishment of the bauxite-alumina industry shifted Jamaica's economy from sugar and bananas. By the 1970s, Jamaica had emerged as a world leader in export of these minerals as foreign investment increased. The country faces some serious problems but has the potential for growth and modernization. Despite over U.S. $4.4 billion in foreign direct investment over the past decade, the economy remains relatively flat. After 4 years of negative economic growth, Jamaica's GDP grew by 0.8% in 2000, and has grown in the 0.5% to 1.5% range, year-on-year, since then. Inflation fell from 25% in 1995 to 6.1% in 2000 and 7.0% in 2001, but has remained in the 10% range since then. Through periodic intervention in the market, the central bank prevents any abrupt drop in the exchange rate. Nevertheless, the Jamaican dollar continues to slip despite intervention, resulting in an average exchange rate of J$65.9 to the U.S. $1.00 by September 2006. Weakness in the financial sector, speculation, and low levels of government investment erode confidence in the productive sector. The government is unable to channel funds into these areas because of an overwhelming debt-to-GDP ratio, which currently stands at approximately 135%. Over 70 cents on every dollar earned by the Jamaican government goes to debt servicing and recurrent expenditure. Tax compliance rates also contribute to the problem, hovering at approximately 45%. Net internal reserves, on the other hand, remain healthy at $2.09 billion at the end of 2005. Free trade zones have stimulated investment in garment assembly, light manufacturing, and data entry by foreign firms. However, over the last 5 years, the garment industry has suffered from reduced export earnings, continued factory closures, and rising unemployment. This can be attributed to intense international and regional competition, exacerbated by the high costs of operations in Jamaica, including security costs to deter drug activity, as well as the relatively high cost of labor. The Government of Jamaica hopes to encourage economic activity through a combination of privatization, financial sector restructuring, falling interest rates, and by boosting tourism and related productive activities. Historically, Jamaica has had close ties with the U.K., but trade, financial, and cultural relations with the United States are now predominant. Jamaica is linked with the other countries of the English-speaking Caribbean through the Caribbean Community (CARICOM), and more broadly through the Association of Caribbean States (ACS). In December 2001, Jamaica completed its 2-year term on the United Nations Security Council. The United States maintains close and productive relations with the Government of Jamaica. Former Prime Minister Patterson visited Washington, DC, several times after assuming office in 1992. In April 2001, Prime Minister Patterson and other Caribbean leaders met with President Bush during the Summit of the Americas in Quebec, Canada, at which a "Third Border Initiative" was launched to deepen U.S. cooperation with Caribbean nations and enhance economic development and integration of the Caribbean nations. The United States is Jamaica's most important trading partner: bilateral trade in goods in 2000 was almost $2 billion. Jamaica is a popular destination for American tourists; more than 800,000 Americans visited in 2000. In addition, some 10,000 American citizens, including many dual-nationals born on the island, permanently reside in Jamaica. The Government of Jamaica also seeks to attract U.S. investment and supports efforts to create a Free Trade Area of the Americans (FTAA). More than 80 U.S. firms have operations in Jamaica, and total U.S. investment is estimated at more than $1 billion. An office of the U.S. and Foreign Commercial Service, located in the embassy, actively assists American businesses seeking trade opportunities in Jamaica. The country is a beneficiary of the Caribbean Basin Trade Partner Act (CBTPA). The American Chamber of Commerce, which also is available to assist U.S. business in Jamaica, has offices in Kingston. U.S. Agency for International Development (USAID) assistance to Jamaica since its independence in 1962 has contributed to reducing the population growth rate, the attainment of higher standards in a number of critical health indicators, and the diversification and expansion of Jamaica's export base. USAID's primary objective is promoting sustainable economic growth. Other key objectives are improved environmental quality and natural resource protection, strengthening democratic institutions and respect for the rule of law, as well as family planning. In fiscal year 2002, the USAID mission in Jamaica operated a program totaling more than $13 million in development assistance. The Peace Corps has been in Jamaica continuously since 1962. Since then, more than 3,300 volunteers have served in the country. Today, the Peace Corps works in the following projects: Youth-at-Risk, which includes adolescent reproductive health, HIV/AIDS education, and the needs of marginalized males; water sanitation, which includes rural waste water solutions and municipal waste water treatment; and environmental education, which helps address low levels of awareness and strengthens environmental nongovernmental organizations. The Peace Corps in Jamaica fields about 70 volunteers who work in every parish on the island, including some inner-city communities in Kingston. Jamaica is a major transit point for South American cocaine en route to the United States. It is also the largest Caribbean producer and exporter of marijuana. A significant increase in cocaine flow through Jamaica was observed during 2001. Jamaica is the embarkation point for the largest number of passengers arrested on drug charges at U.S. airports. U.S. assistance has played a vital role in stemming the flow of drugs to the United States. In fiscal year 2001, the Jamaican Government seized over 1,700 kilograms of cocaine. Several large seizures in late 2001 contributed to a doubling of interdicted cocaine during calendar year 2001 over 2000. The Jamaican Government eradicated 436 hectares of marijuana in 2001, nearly 800 hectares short of its 1,200 hectare goal. Authorities also seized and destroyed 72.6 metric tons of marijuana in 2001, a sizable increase over 2000. Over 7,450 drug arrests were made in 2001, including 415 foreigners. A bilateral maritime interdiction cooperation agreement is facilitating U.S. Coast Guard and Jamaican military coordination. The U.S. Embassy in Jamaica is at 142 Old Hope Road, Kingston 6; tel: (876) 702-6000; fax: (876) 702-6001. The USAID Mission is at 2 Haining Road, Kingston (tel. 876-926-3645). The Peace Corps is at 8 Worthington Avenue, Kingston 5 (tel. 876-929-0495). Log onto the Internet at http://kingston.usembassy.gov/ for more information about Jamaica, the U.S. Embassy and its activities, and current contact information.